Retail Brokers: Who’s Growing and Who’s Not? I did a little recon work for you guys over the weekend to find out which forex brokers are growing and which ones aren’t. But I didn’t need to practice my stealth skills to get this info… I just took a look at the CFTC’s latest report! Below, you’ll find financial data for the month of August for retail foreign exchange dealers (RFED) that are registered with the CFTC. minimum dollar amount for FCM’s offering or engaged in retail forex transactions and RFEDs ($20,000,000) plus five percent of the FCM’s or RFED’s total retail forex obligation in excess of $10,000,000. Excess net capital is adjusted net capital, less the firm’s net capital requirement. In layman’s terms, a firm’s net capital requirement is the minimum amount of capital that the broker must hold, while excess net capital refers to adjusted net capital minus net capital requirement. Total Amount of Retail Forex Obligation, on the other hand, just refers to how much money the broker is holding for its clients. 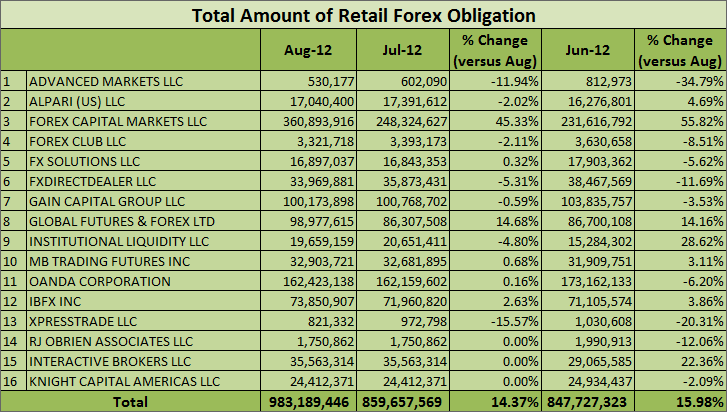 A quick glance at the figures shows that August was a good month for the retail forex industry. It’s particularly comforting to see that excess net capital is on the rise because it tells us that retail forex brokers are well-capitalized, which decreases the chances of them leaving their clients high and dry. Meanwhile, total deposits were up by 14.37% from July and 15.98% from June. For the most part, it’s suspected the pick-up in deposits was brought about by post-summer volatility as traders came back from their vacations. It’s not all good in the hood though. A closer look at the numbers reveals that not all brokers posted gains during the month. In fact, only 6 of the 16 brokers registered with the CFTC saw client deposits increase from July to August. The remainder saw very little to no changes in August. The bulk of the growth was generated by two of the most renowned brokers in the industry. FXCM, the biggest broker in the FX hood, led the pack with a 45.33% growth in deposits from July and 55.82% increase from June. It was then followed by GFT, who grew over 14% in August from July, a tad higher than the growth it posted from June. I can’t help but wonder why deposits were concentrated in just two brokers. Are traders flocking to them and depositing more money because of superior services and offerings? Or is it the result of aggressive marketing? I’ll have to make use of my ninja skills to delve deeper into the subject and find out. But whatever the reason is, the report should still be good news to the Average Trading Joe. It shows that the retail forex industry is still growing, and as we all know, more trading activity can lead to higher liquidity in the markets. With a last name like Ninja, I decided long ago to specialize in espionage. And with my first name being Forex, you guessed it, my other pasison was, well, anything and everything FX. Naturally, I decided to combine my two loves into one, "spying" on the forex industry which I call "espipionage." I give traders the inside scoop on developments in the forex industry, such as changing broker regulations, new currency trading products and companies. I also profile existing companies that are making an impact on retail forex traders, all for your benefit. Set your night vision goggles ON. It's Spy Time!